Widower Gil Montgomery's new nanny has a secret. There's a reason Julie Bishop and Gil's daughter, Abby, connect so perfectly--Julie is Abby's birth mother. Julie gave her daughter up for adoption years ago, but she couldn't resist the chance to be close to the child her heart never forgot. But Julie never imagined she'd fall for the handsome adoptive dad. Gil's been burned before, and Julie worries that if her secret is exposed, he'll never forgive her. The perfect family is so close, but so far... Unless Gil can let the past go and welcome Julie home. Right where she belongs. 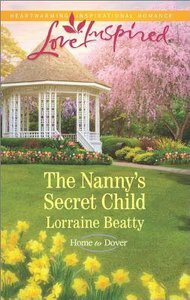 About "The Nanny's Secret Child (Home to Dover) (Love Inspired Series)"